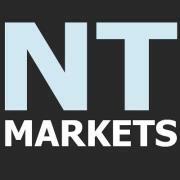 Thursday 9th July- Market Wrap-Phoenix rising in China | Beeks Downunder-Because not all financial news is boring! ASX 200 finishes up 1.5, slightly positive after huge relief rally. China finally stabilises as ‘Kitchen Sink’ trade seems to be working up 6.2%. Resources outperform Banks. Dow futures up 102. There is an old market saying of ‘Shake the trees and see the Monkeys fall’. So far this week we have seen a whole troop fall as the Chinese market has thrown global markets into a funk. Today though some sanity returned. After an early rout in the first half hour taking out the 5400 level, buyers stepped back in.The opening of the Chinese market helped allay the fears and the unemployment numbers also steadied the ship. From the outset the miners outperformed their industrial and banking cousins which was a surprise given the huge fall in iron ore last night. The Chinese market opened slightly down but no crash and rallied from there. We took heart from that and pushed higher,at one point being up over 20 points ,before closing virtually unchanged and out of breath, for a trading range on the day of around 110 points. Seems that the fall in the iron ore price has been taken as a positive by the sector with miners all rallying. A sharp bounce back from iron ore futures in China, nearly 6 per cent higher in early trade, signalling the selloff may be over for now. BHP +1.77 %, RIO + 1.66 %, and Fortescue Mining (FMG) + 6.57%.Base metal stocks also ran as LME prices received a boost overnight.Independence Group (IGO) + 4.0 %, Oz Minerals (OZL) + 2.17 % and Sirius Resources(SIR) + 4.21 %. The Bloomberg World Mining Index of 79 producers dropped 17 % in the past 10 days as prices for industrial metals such as copper, nickel and aluminium sank to six-year lows. Chinese demand for commodities is falling, with imports of iron ore in May contracting 12 % to 70.87 million metric tons from the previous month. Imports of coal plunged 28 % in the month to their lowest in more than four years. Financials were the drag on the market today, surprising really given their relatively small exposure to either Greece or China. The big four off around 0.2-1% with insurers slightly weaker led by Suncorp (SUN) -0.22 %. REITs were a little left out as were wealth managers although BT Investment Management (BTT) + 4.26 % did improve ahead of their retail share offer close tomorrow. In other financial stocks Bell Financial (BFG) + 11.63 % announced a 300% increase in first half profits at $8m.Equities execution and capital markets showing the big improvement. Broking revenue was up 30 per cent and its client numbers rose 23 per cent to 75,000. In other results today Caltex (CTX) – 1.44 % fell away slightly despite a 45% increase in profits. The company was a big beneficiary of wider margins and a slumping oil price in its refining business. For the six months through June, Caltex said it posted a net profit on a replacement cost basis, which strips out the value of its stockpiles of $251m, up from $173 million in the same period a year earlier. US reporting season has kicked off with the traditional result from Alcoa .The Company reported second quarter 2015 net income of $140 million, or $0.10 per share, including $143 million in restructuring-related charges, primarily to optimise the Company’s upstream portfolio. Year-over-year, second quarter 2015 results compare to net income of $138 million, or $0.12 per share, in second quarter 2014.Our Aussie company Alumina (AWC) + 4.21 % says it received $US71 million in income in the first half, while its joint venture partner Alcoa has announced a small quarterly earnings boost. That did not take long, Chinese businessman Richard Liu has begun his splurge on Australian companies, spending about $20 million on a stake in Murray Goulburn’s new unit trust. (MGC) +0.86 %. Mr Liu’s e-commerce company, JD.com, which is listed on the NASDAQ, snapped up 4.6 per cent of the dairy co-operative’s trust, which listed on the ASX last week. Telstra (TLS) + 0.32 % announced today that it was going to throw another $5bn on its mobile and internet networks in an effort to fend off Optus and others. Telstra has been a huge beneficiary of the own goal that Vodafone made some years ago and have taken vast numbers of their customers. But there is a new Vodafone on the block now ,coupled with Optus and smaller upstarts like Amaysim,Telstra need to keep ahead as data and mobiles are the bedrock of their success. In economic news, Australia’s unemployment rate climbed to 6 per cent in June, from a revised 5.9 per cent in May, according to the ABS. This was better than analysts had expected at around 6.1% The ABS said on Thursday that the number of people employed rose by 7300 to 11.77 million, seasonally adjusted. This net gain was the result of 24,500 new full-time workers and 17,200 fewer part-timers. However, the participation rate also rose, from 64.7 per cent to 64.8 per cent. The market took this as a positive leaving the chance of a rate cut receding into the background. The AUD was firmer at 74.5c on the back of these numbers. 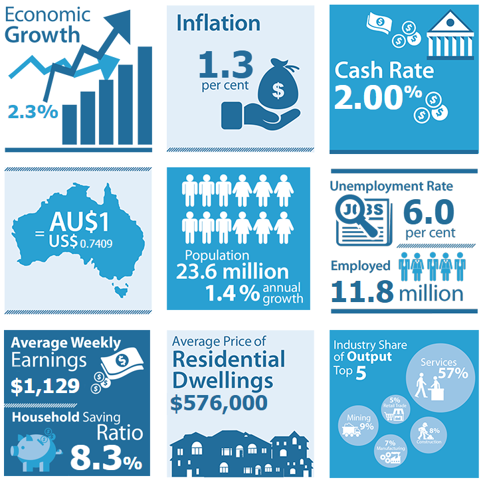 Good summary from the RBA in their July snapshot. Turning overseas, China has finally found some mojo,after a shaky start, the Shanglow was up around 1.3% at lunch time as some calm descended. Hong Kong also bounced seriously up around 3.4% with japan slipping 1.35%. The big problem in China has been the margin lending that has fuelled the huge price rises this year. 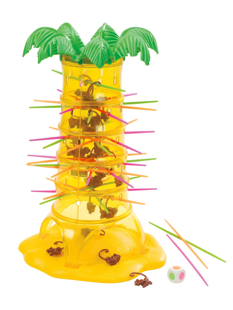 As things unwind, it feeds on itself much like a tornado in one of those disaster movies. Unfortunately it is not just mums and dads who are leveraged up to the kazoo but companies themselves have pledged their own stock to leverage into others far easier to ride the wild roller coaster than actually do something. This explains why some of the companies have been suspended recently to stop them feeding on themselves. Not only has iron ore rallied in our time zone around 6% but oil too is firmer with Brent Crude up around 1.1%. It looks though tonight we will get a downgrade of world growth from the IMF. It has cut its 2015 global growth forecast to 3.3 per cent from 3.5 per cent three months ago, but it has kept its 2016 prediction at 3.8 per cent. There was no specific mention of our economy but they noted other countries would fall to 2.7% from 2.8% growth. They kept their China forecast at 6.8% but interestingly dropped the US forecast as a bad start to the year with weather related issues has crimped growth. Expect some nerves in Europe tonight as Greece prepares its cunning plan but the steady Chinese market will drag the buyers back in on bargain hunting. Dow futures are up around 108 points, pointing to a better day in the US. We will probably see a positive day again tomorrow. Friday is usually an up day but volumes are likely to remain thin and investors skittish with Greece front and centre this weekend. 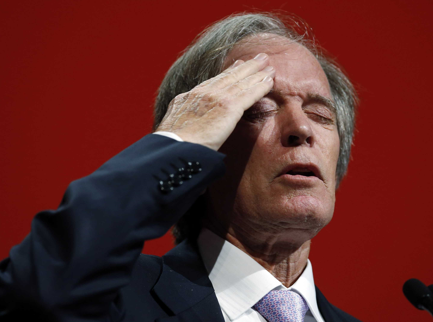 And finally spare a thought for US bond superstar Bill Gross. Back in June he called the Chinese market ‘the short of a lifetime’. Pity he didn’t actually do the trade though. He choose to leverage his view through the Dow and currencies. Doh!